it is showing signs of a 5 wave top … now, we simply don’t know if this is the 1st of 5 to come or it’s the end of the emotional euphoria over social media. perhaps another high flyer can give us a sense? TWTR is showing the BEST BUY pattern of the bunch. the entire 50-56 area, w/ 54 being especially important, is key support. 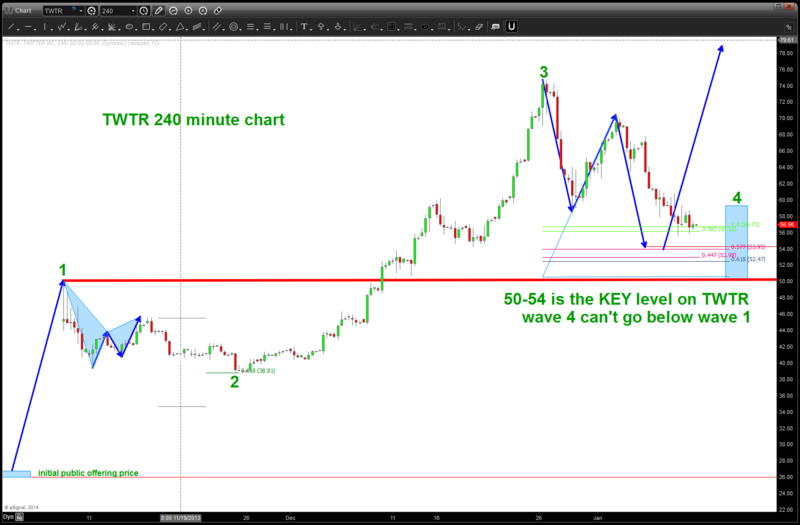 I have put a wave count that uses the IPO price of 26 as the beginning and then off to the races. just like the last JPM Morgan (JPM) post – trade what you see. I see a BUY PATTERN appearing on TWTR. If it WORKS (I don’t know if it will or won’t) then we could go up and see new highs. If it fails and goes below 50, then this count is WRONG and it’s back to the drawing board. take note of the SOCM post – it looks due for a big correction – that is – the entire space. So, just make sure to keep an eye on these levels …it’s a BUY PATTERN but I still recommend CAVEAT EMPTOR. ← Check this out- amazing whitepaper on wealth creation!